Why not support the Society by becoming an Honorary Member? 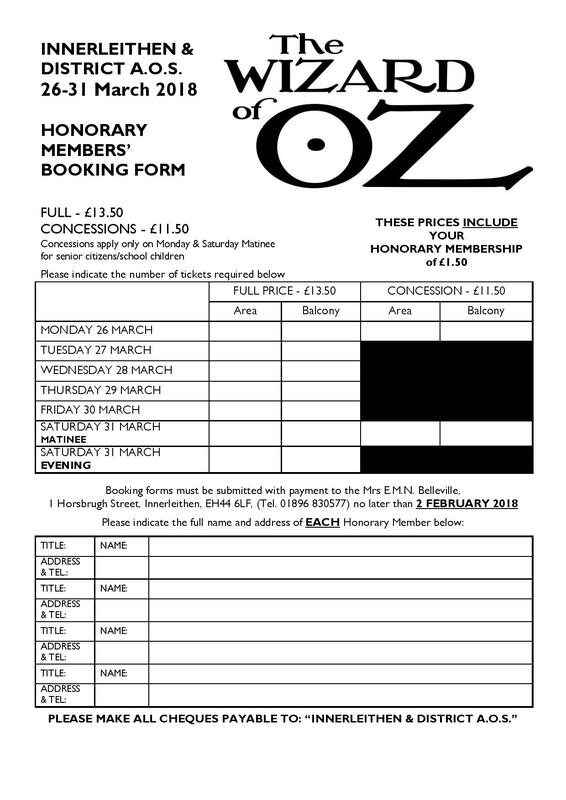 It is my great pleasure to invite you to become an Honorary Member and support our production of THE WIZARD OF OZ. Developed from the ever popular MGM screenplay, our production contains all the much-loved songs from the Oscar winning movie score, all the favourite characters and iconic moments! From sixteen Honorary Members in 1909 to over two hundred today – your support remains vital to the Society. By paying that little bit more for your tickets you are not only ensuring good seats with tickets delivered to your door, but the continued success of Tweeddale’s only amateur operatic society. PLEASE NOTE THAT THESE PRICES INCLUDE YOUR HONORARY MEMBERSHIP SUBSCRIPTION (£1.50 PER TICKET). or Print Out This Form and return it to us. To those of you who have supported us in the past, the Society extends its grateful thanks and to those who are joining us for the first time, a warm welcome.